Early menopause is when menopause occurs before the age of 40. There are a number of medical treatments that trigger the onset of early menopause, such as chemotherapy and hysterectomy, but it can sometimes happen on its own and without warning. This can be very distressing for some women, especially those who were planning to have children in the future. Women with early menopause will generally suffer from the same menopause symptoms as women who experience it later in life, and this includes breast pain. Why Might Early Menopause Occur? Aside from medical procedures like the ones mentioned above, early menopause might also be a result of certain biological abnormalities. These include chromosome defects, genetics, family history, and autoimmune diseases. It is quite a rare occurrence and will not happen to the vast majority of women. If your period stops or changes from the norm before the age of 40, this could be a sign. However, it is important to visit a doctor as it could also be a result of a treatable health issue or pregnancy. Menopause symptoms, like hot flashes or breast pain, could also indicate early menopause, but again, at a younger age, these could also be indicative of something else. The doctor might do a blood test to see if any issues really are caused by early menopause. 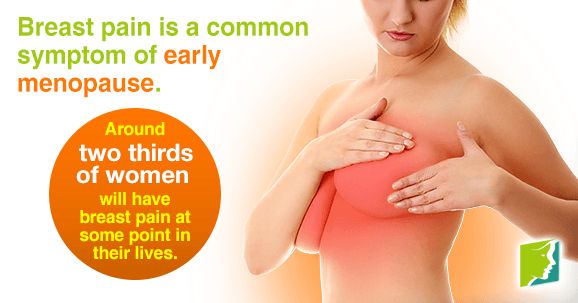 Breast pain is a common symptom of early menopause, although it is not exclusive to it. In fact, around two thirds of women will have breast pain at some point in their lives. It can range from a mild tenderness to a feeling of intense burning or throbbing. It is mainly caused by the hormonal changes that will go on in the body during early menopause; the drop in estrogen levels can cause soreness or inflammation of the breast tissue. A diet low in fat and high in fiber will encourage the body to secrete more estrogen, and this should reduce inflammation of the breast tissue. In addition, it will help normalize blood sugar, a known tool against breast pain. Furthermore, some women find that breast pain during early menopause can be managed by avoiding salt and caffeine. Exercise will also help normalize blood sugar and stabilize hormone levels, reducing the intensity and frequency of breast pain during early menopause. However, make sure you are wearing a well-fitting sports bra, since if the breasts are not well-supported, exercise can also be painful. Breast pain during early menopause is a common symptom (even if early menopause itself is not), but the good news is, it does not have to be inevitable. You can prevent breast pain, and it's easy to manage. By making a few lifestyle changes, breast pain during early menopause can be kept to a minimum. How Do I Know If I Am Going Through Early Menopause? Early menopause affects a number of women. Click here to learn more.